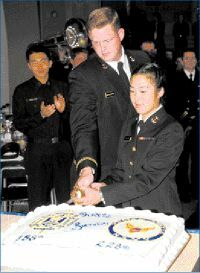 The Naval Academy celebrated its birthday and the Navy's birthday with a cake cutting ceremony Oct. 10. The academy's birthday was Oct. 10 and the Navy's was Monday. Addressing the midshipmen from the Anchor in King Hall, Cmdr. Patricia Cole, 1st Battalion commander, told the brigade how the Continental Congress established the Navy in October 1775. She said the Navy started when the Continental Congress authorized two wooden cruisers. She praised the men who sailed them to defend America's shores and the members of today's modern Navy. She said both served with "honor, courage and commitment." From the youngest seaman to the chief of naval operations, she said they all performed their duties with great skill and precision. "They are superb Sailors," she said, "and it's an honor to be a part of the greatest naval fighting force in the world." She encouraged the midshipmen to share in that pride and wished the brigade a happy 228th birthday. The cake cutting completed the ceremony. The oldest midshipman, Midn. 1/C John Actkinson, 26, and the youngest midshipman, Midn. 4/C Francine Lee, 17, cut the cake. Midn. 1/C Diana Roach organized the ceremony with help from Midn. 1/C Drew Thomas and Midn. 2/C Travis Amerine. Find people you served with in the military.